Chile: Mapuches indigenous on the 10th day of a hunger strike. Chile: Imprisoned Mapuche Continue Hunger Strike. Fifteen indigenous Mapuches are on the 10th day of a hunger strike in Temuco Prison to protest Chile's anti-terrorism law, and each has lost about eight pounds, according to an official medical report. The report, issued Thursday, also warns that the cold, in one of the worst winters in recent years with below-zero temperatures, could complicate their health. However, strikers reiterated their decision to continue their protest of the repressive Anti-Terrorist Law, approved during the Augusto Pinochet dictatorship, along with other demands. Six more prisoners in other Chilean jails joined the movement in the past few hours, it was reported. While the strikers' situation is receiving scant coverage in the Chilean mass media, a Gendarmerie report on the prisoners' weight loss was issued by investigator Lucia Sepulveda. Prisoners also accuse authorities of scattering them in different prisons around the country to "break up the communities and their organizations." In the meantime Newentuain, a group of relatives of Mapuche political prisoners based near Concepcion, asked for solidarity from popular organizations, because the prisoners' "families are in danger of disintegration and the rights of their children are violated in every raid and arrest." The prisoners say they are being persecuted for demanding their "just human, political, territorial and cultural rights." 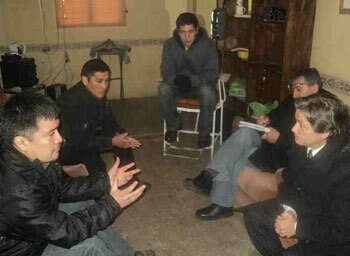 Senator Alejandro Navarro visited prisoners Hector Llaitul Carrillanca, Ramón Llanquiqueo Pilqueman, Jose Huenuche Reiman and Luis Menares Chanilao, in the El Manzano (Concepcion) jail and called on the government "to act as soon as possible to prevent a worsening of the effects of the strike." "This is not a political movement but a movement in defense of their lands, a cause that I consider legitimate," he said, calling the 106 jailed Mapuches "political prisoners." Thirty-six of them are being charged under the anti-terrorism law. The four on hunger strike face possible sentences of 52 years (for Jose Huenuche) to 103 years for Hector Llaitul.